EXPERIENCE THE DAYTONA 500 AT THE DAYTONA INTERNATIONAL SPEEDWAY IN 2020! Our 2020 NASCAR Daytona 500 race packages, travel packages and tours include excellent Daytona 500 Monster Energy Cup race tickets and Xfinity Series tickets in Sections 380 or 435 or upgrade to your choice of Sections 364, 338, 437, 358, or 344, deluxe track transportation to Daytona International Speedway Saturday and Sunday, tour representatives, optional hospitality and fan zone passes, optional scanner rental and much more. The 2020 NASCAR racing season begins at Daytona International Speedway with the running of the 62nd Annual "Great American Race", the Daytona 500. This package is for those that already have hotel accommodations or a timeshare but still want to take advantage of our hassle free service. Hotel accommodations are not included. Xfinity Series & Daytona 500 Monster Energy Cup Series tickets are in Section 380 (Turn One Middle) or Section 435 (Pit In Upper) or you can Upgrade to Section 364 (Pit Out Middle) or Section 437 (Pit In Upper-Closer to start/finish than Section 435). Section 364 are in the Mid-Level tickets and are across from the pits. These Sections are to the turn one side of the start/finish line and are closer to bus parking. There are another 40 rows below you in the Lower Grandstand. Sections 435 and 437 are in the Upper Level with the Mid-Level (30 rows) below you and the Lower Level (40 rows) below that. Sections 435 and 437 are to the turn 4 side of the start/finish line and a further walk from bus parking. Section 437 is closer to the start/finish than Section 435. You can see the entire track from Mid-level and Upper Level seats and have a great view of pit road. Any of these seats are Great Seats! Originally a course that went 1.5 miles down the highway, turned and then came back the same distance on the beach, the evolution of the "World Center of Racing" began with the opening of what is now Daytona International Speedway. Opened in 1959, this 2.5 mile tri-oval superspeedway is home to the "Great American Race"- the Daytona 500, the biggest, richest and most prestigous race in America. With the capacity to seat more than 168,000 fans, Daytona International Speedway offers banking of 3 degrees on the straightaways and 31 degrees in the turns- the most possible before the paving machines actually tipped over. Drafting was birthed at this track when Junior Johnson discovered he could run faster by tucking his car in close behind another rather than running alone. DIS's Daytona 500, NASCAR's biggest event has hosted many of the sport's greatest moments and possibly its greatest tragedy. In 1998 Dale Earnhardt took the checkered flag after his 20th attempt at the coveted title. Just three years later, the track took his life in a turn 4 wreck on the final lap of the race. The infamous 2.5 mile Daytona International Speedway promises close side-by-side competition and fast speeds approaching 200 miles per hour along with historical moments all along the way. Thursday: The unique Daytona 500 qualifying races: the Gatorade Duels, the two most exciting 60 lap sprints in NASCAR will be held tonight. Upper level race tickets and deluxe bus transfers are not included with this package but are optional for tonight. Friday: The Camping World Truck Series race is at the track tonight. Deluxe Bus Transfers and Upper Level Truck race tickets are not included with this package but are optional for today. Saturday: The anticipation heightens as our motorcoach departs early for the Daytona International Speedway for the Xfinity Series 300 race. We depart early today for the Xfinity Series Race and Monster Energy Cup practice sessions. After the race, we'll return hassle free back to our hotel pick up location. Sunday: The start of the 2019 NASCAR Monster Energy Cup season is here! Our deluxe motorcoach departs early Sunday morning for the stress free ride to Daytona International Speedway for the Great American Race, the 2019 Daytona 500. After an electrifying day of racing, sit back and relax while we take you back to the hotel. We traveled with another tour group to the Daytona 500 last year and this by far was more organized and a much much better experience. We will definitely choose TABA again for our next NASCAR trip. TABA is awesome! I saw the start of the race from the fan zone on top of the garages behind pit road, what a view! Then moved up to our seats in the grandstand where I could see the entire track. Perfect! The seats we upgraded to were amazing. Mark, our TABA tour guide was great with an awesome personality. Fun experience, will do it again. This is my second time with there and back both times were awesome. You guys and girls know how to do it right. Josh (TABA tour rep) was my person who set everything up. He was awesome, answered all my questions, and really cool to deal with. Thank you so much for the experience. Awesome seats with views of entire pit road, start finish line,front stretch and turn one. Mark (TABA tour rep) was pleasant informative service oriented and very knowledgeable. I have really enjoyed going with TABA to the nascar races. Christopher Stracuzza is such a delight to be the tour rep.
Another fabulous trip with TABA. Our seat location was outstanding. The surprise Meet and Greet with Martin Truex Jr was wonderful. Both Rex and Shane (TABA tour reps) did a great job. Can't wait for my next race with TABA. Our tour guide Mark ensured we all had a great time and all the information needed to have a terrific experience at the Daytona 500. A deposit of $150.00 per traveler is due to secure your reservation. A 2nd deposit to equal $300.00 per traveler is due by November 17, 2019. Full payment is due by January 1, 2020. Section 380 is located in the 3rd (or mid-level) at Daytona International Speedway. These seats are located on the front stretch between start/finish line and Turn One. There seats are folding Stadium Style seats and are located at the exit of pit road. You can see the entire track and you can see down pit road to see all the action. These seats are in the Pit Out Middle, rows 4-20. There are 40 rows below you in the Lower Level. These are Great tickets. Section 435 is located on the front stretch toward Turn Four. It is located at the entrance to Pit Road...halfway between the start/finish and turn 4. You will be able to see around the entire track and have a great view of pit road entrace. These seats are folding Stadium Style seats and located on rows 33 and 34. There are 30 rows below you in the Mid-Level and another 40 rows below that in the Lower Level. These are very good seats. Please note that our buses will be parking in the Turn One area and there could be long walks to the seats. Section 437 is considered a Pit In Upper section. It is located between the entrance to pit road and the start/finish line. These ticktets are in rows 32 - 39 and are folding stadium seats and have an excellent view of Daytona International Speedway and all of Pit Road. The Mid Level with 30 rows are located below these seats and the Upper Level with 40 rows are located below that. There are high but excellent tickets. Please note that our buses park in Turn One. There could be long walks to your seats. Section 364 is located in the Mid Level near the start/finish line and across from the pits. These are stadium style seats in rows 3-15. There are 40 rows below you in the Lower Level. These seats have a great view of the entire Daytona International Speedway and a great view of pit road. These seats are between the start/finish line and the exit of pit road. These are Great Seats! Sections 340-362 are located in the 3rd level of the Start/Finish Section and is part of the Tri-Oval Club. This Section is directly across from the pits. These are stadium style folding seats. These seats have a great view of the entire Daytona International Speedway and of pit road. These seats are considered to be the best at Daytona. Bus departs from the Country Inn and Suites - Orlando Airport. Bus departs from the Holiday Inn - Daytona Beach Shores. Bus departs from the Embassy Suites - Orlando Airport. If you want to be in the middle of the action during Speedweeks, then the UNOH Fanzone is where you need to be. Current stars, past legends, fast cars and diehard fans collide in this sprawling entertainment space that sits in the heart of the World Center of Racing. Neighboring pit road and nestled between the NASCAR Cup and XFINITY Series garages, the UNOH Fanzone is the hub of race weekend excitement as fans descend upon a spot that’s long on old-school charm, yet not short on modern amenities. Truly the ultimate way to take your race experience to the level, the UNOH Fanzone puts you in the driver’s seat when it comes to inside access to your favorite cars and drivers. Quite simply, there is no experience in motorsports that connects you with the action quite like the UNOH FANZONE. Whether you’re a car enthusiast looking to observe the hardworking pit crews or are here for the party and looking to grab a premier spot for the DAYTONA 500 Pre-Race Show, the UNOH Fanzone's entertainment schedule will have you covered. Did we mention kids 12 and under are FREE in the UNOH Fanzone (daily admission ticket required)! Be sure to make your race day experience a family affair. EXPERIENCE DAYTONA LIKE A VIP! Rub elbows with racing icons, sign the start-finish line join the pre-part party and much more by upgrading your experience with UNOH Fanzone access! Check out the UNOH Fanzone and the Midway for your chance to see your favorite driver take the stage and answer questions on a wide range of topics. Past guests include Carl Edwards, Kyle Busch, Ryan Newman, Dale Earnhardt Jr. and Kyle Larson. Close your eyes in the UNOH Fanzone and you can hear what makes DAYTONA so special. Whether it's the roar of the crowd as cars race three-wide, door-to-door down the backstretch or the deafening sound of the Thunderbirds racing overhead, ringing out the freedom that "The Great American Race" represents, the DAYTONA 500 is just waiting to speak to you. No event in all of motorsports enjoys the pomp and circumstance as that surrounding this sacred race. With UNOH Fanzone/Pre-Race Access, you are invited to take a first-hand role in the celebration as fans can play witness to the DAYTONA 500 Pre-Race Show, driver introductions and the parade lap, and even the much-anticipated United States Air Force Thunderbirds flyover. The UNOH Fanzone is committed to the history of the sport. As such, expect to see collections displayed from some of NASCAR’s greatest drivers and moments. It’s a once-in-a-lifetime experience to touch history --- and take a picture with it. A DAYTONA tradition unlike any other in all of sports. Spend pre-race walking the trioval, exploring the 18-degree frontstretch banking for yourself. Take a selfie on these hallowed grounds and make sure to sign the start/finish line. Looking to fill out that autograph collection with your favorite driver? Pack your sharpie because this is the place to do it. Legends from racing's past and the United States Air Force Thunderbirds will be made available throughout the weekend to meet you and sign your prized possessions. Fans in the UNOH Fanzone enjoy a massive screen measuring 20 feet tall by 40 feet wide. Additionally, the Alert Today Florida Main Stage has been relocated to create better views of the new board as well as improve access and flow throughout the area. The UNOH Fanzone is perfect for all ages as kids will be entertained for hours climbing the rock wall, getting their faces painted, or even playing around in the bounce house. Don’t forget – kids 12 and under are FREE inside the UNOH Fanzone throughout Speedweeks. Swing by the Fanatics Infield Superstore store to show your support for your favorite driver. We have all of your race day needs covered all weekend long with exclusive hats, shirts, flags and more. *UNOH FanZone is a product of Daytona International Speedway. We have no control over the quality of the hospitality tent and can not be held liable for the content or services rendered. We can not refund any monies if you are unable to attend for any reason. NASCAR Camping World Truck Series ticket and roundtrip track transportation via deluxe motorcoach on Friday. These seats are Upper Tower tickets. Budweiser Duels 150 ticket and roundtrip track transportation via deluxe motorcoach. These seats are Upper Tower tickets. Located near Turn 4 of Daytona International Speedway is the new Motorsports Hall of Fame of America Museum. The Museum features exhibits from all forms of motorsports. *The Museum is serviced by Daytona International Speedway and admission hours and dates are subject to change. The RE3000 features a display showing the name of the driver and the channel allowing you to listen to all the audio between drivers, crews, spotters, race officials, broadcast radio feeds, and track announcers. We will have your scanner ready when you arrive at the track and after the race you can bring your rental back to the bus (some exceptions apply). No Long Lines to wait in. No Credit Cards to hand over to strangers. And absolutely No Hassles! Be sure to reserve your scanner in advance! The RE3000 features a display showing the name of the driver and the channel allowing you to listen to all the audio between drivers, crews, spotters, race officials, broadcast radio feeds, and track announcers. 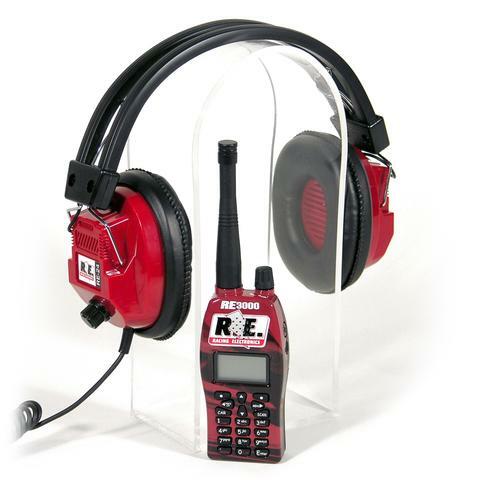 This RE 3000 scanner comes with 2 Headsets connected with a splitter allowing you to listen to the race with the person sharing the scanner with you. We will have your scanner ready when you arrive at the track and after the race you can bring your rental back to the bus (some exceptions apply). No Long Lines to wait in. No Credit Cards to hand over to strangers. And absolutely No Hassles! Be sure to reserve your scanner in advance! The RE3000 features a display showing the name of the driver and the channel allowing you to listen to all the audio between drivers, crews, spotters, race officials, broadcast radio feeds, and track announcers. This RE 3000 scanner comes with 2 Intercom Headsets each with a microphone allowing you to push a button to talk to the person sharing the scanner with you. The conversation comes in over the race broadcast. 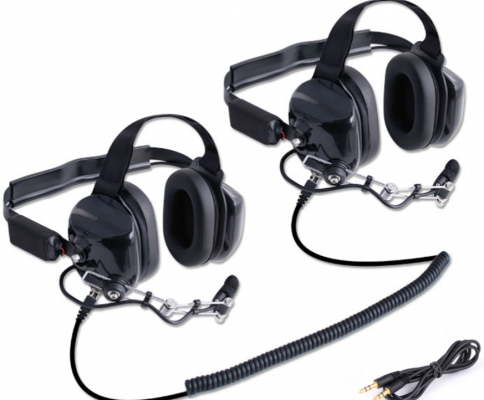 You do not have to take off the headset to hear the other person. We will have your scanner ready when you arrive at the track and after the race you can bring your rental back to the bus (some exceptions apply). No Long Lines to wait in. No Credit Cards to hand over to strangers. And absolutely No Hassles! Be sure to reserve your scanner in advance! The FanVision features the live race broadcast – both video and audio, up to 8 in-car cameras, radio scanner for all drivers, driver updates and comparisons, live stats during the race, championship standings, race series results, and split-screen or full-screen options. We will have your FanVision ready when you arrive at the track and after the race you can bring your rental back to the bus (some exceptions apply). No Long Lines to wait in. No Credit Cards to hand over to strangers. And absolutely No Hassles! Be sure to reserve your FanVision in advance! 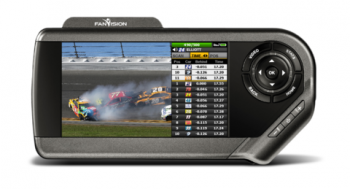 The FanVision features the live race broadcast – both video and audio, up to 8 in-car cameras, radio scanner for all drivers, driver updates and comparisons, live stats during the race, championship standings, race series results, and split-screen or full-screen options. This FanVision comes with 2 Headsets connected with a splitter allowing you to listen to the race with the person sharing the FanVision with you. We will have your FanVision ready when you arrive at the track and after the race you can bring your rental back to the bus (some exceptions apply). No Long Lines to wait in. No Credit Cards to hand over to strangers. And absolutely No Hassles! Be sure to reserve your FanVision in advance! The FanVision features the live race broadcast – both video and audio, up to 8 in-car cameras, radio scanner for all drivers, driver updates and comparisons, live stats during the race, championship standings, race series results, and split-screen or full-screen options. This FanVision comes with 2 Intercom Headsets each with a microphone allowing you to push a button to talk to the person sharing the FanVision with you. The conversation comes in over the race broadcast. You do not have to take off the headset to hear the other person. We will have your FanVision ready when you arrive at the track and after the race you can bring your rental back to the bus (some exceptions apply). No Long Lines to wait in. No Credit Cards to hand over to strangers. And absolutely No Hassles! Be sure to reserve your FanVision in advance! This is There And Back Again Adventures Discount for Children that are age 15 and under. This discount can be combined with the posted Track Discount for Children Tickets listed under options if applicable. This discount CAN NOT be combined with any other Discount other than the posted Track Discount for a Child's Ticket. We ship your event tickets/documents via Federal Express 7 to 10 days prior to your tour to a United States street address for a charge of $30.00. We can also hold your tickets/documents for pick up at the hotel for $10.00 (recommended for International Customers). If you choose the "pick up at hotel" option, we will email a copy of the tour documents 7-10 days prior but will hold your tickets/documents at the hotel to be distributed by our tour representative. A deposit of $25.00 per traveller is due to secure your reservation. Full Deposit: Due at 90 days prior to the event. Full Payment is due 60 days prior to the event. Copyright 1988-2018. || There And Back Again Travel, Inc. All Rights Reserved.